By Donald Goodman & Thomas Head, eds. At the time of his death in 1998, Mobile author and Renaissance man Eugene Walter had filing cabinets full of recipes he had collected and a number of different writing projects under way. 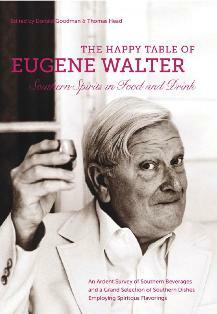 In addition to several volumes of fiction, poetry, and translations, Walter had already published American Cooking: Southern Style (1971), a very successful cookbook for the Time-Life Foods of the World series, Delectable Dishes from Termite Hall: Rare and Unusual Recipes (1989) and Hints and Pinches: A Concise Compendium of Herbs, Spices, and Aromatics with Illustrative Recipes and Asides on Relishes, Chutneys, and Other Such Concerns. One could say he was a well-seasoned cookbook writer. Now, Donald Goodman, Walter’s heir and literary executor, has, with the help of Thomas Head, a D.C.-based food writer, completed and edited a volume of recipes under way at the time of Walter’s death, every one of which includes some kind of alcoholic spirits. The first section is, appropriately enough, forty recipes for drinks. The title is “The Cocktail, Or, I Feel Better Already.” Included are punches, juleps, and eggnog sipped and eaten with a spoon, all southern style. No recipes for Manhattans or appletinis. In his commentary Walter explains that the word “cocktail” is, finally, a corruption of the French word for eggcup, coquetier, once used to measure brandy. There is appropriately, a section on hangover cures. He also declares that iced tea on the Gulf Coast is taken in warm weather as mid-morning and mid-afternoon refreshment, never with food. Good to know. Second is the section on cocktail snacks and first courses, soups hot and cold, and patés. Next is a long section on seafood with a nice commentary on oysters and their history and mythology. One 1803 French cookbook states that oysters are the “usual opening to winter breakfasts.” Who knew? A short section on rices and pastas is followed by a very long chapter on desserts, enough dessert recipes to last the rest of your sweet, liqueur-flavored life. Included are wonderful photos of Walter—in Greenwich Village and Rome and after his return to Mobile in 1979, many of which I had not seen before. There are also scattered throughout many truly charming drawings by Walter, of cats and monkeys and also his representations of the spinach lady and her parsley dog; of Miss Cabbage, King Garlic, and Queen Onion, Mr. Turnip and Miss Nutmeg; and many others. The volume opens with a biographical sketch of Walter’s amazing peripatetic life as he moved from World War II in the Aleutian Islands to Greenwich Village to The Paris Review to Rome as script translator and actor during the golden age of Italian movie making, but inexplicably fails to mention Carolyn Haines’ wonderful collection of remembrances, Moments with Eugene, or Katherine Clark’s comprehensive, delightful, as-told-to autobiography of Walter, Milking the Moon.